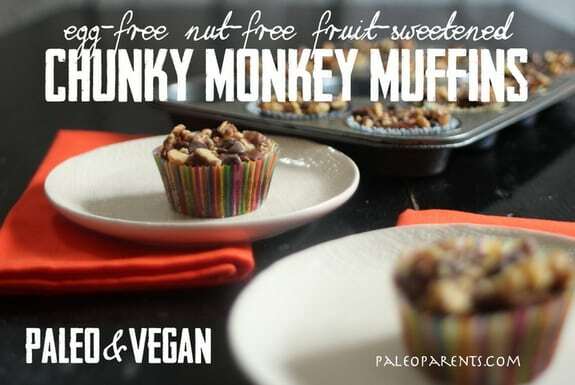 For our kickoff recipe for March Muffin Madness, we have my friends Stacy and Matt from Real Everything (formerly Paleo Parents) sharing their gluten-free Chunky Monkey Muffins! What a great recipe to launch the series! I mean who can resist any recipe that has Chunky Monkey in its name? Stacy, Matt, Cole, Finian, and Wesley are well known for their award-winning recipes and their successes with the paleo diet. They have been featured in national publications, live speaking events, on radio shows, podcasts, videos, and news programs. Matt and Stacy are the authors of several paleo cookbooks—Eat Like a Dinosaur: Recipe & Guidebook for Gluten-Free Kids, Beyond Bacon: Paleo Recipes That Respect the Whole Hog, and Real Life Paleo: 175 Gluten-Free Recipes, Meal Ideas, and an Easy 3-Phased Approach to Lose Weight & Gain Health. Through all that, though, they say they are just a suburban family: a working mom and stay-at-home dad who raise three active young boys the paleo way. 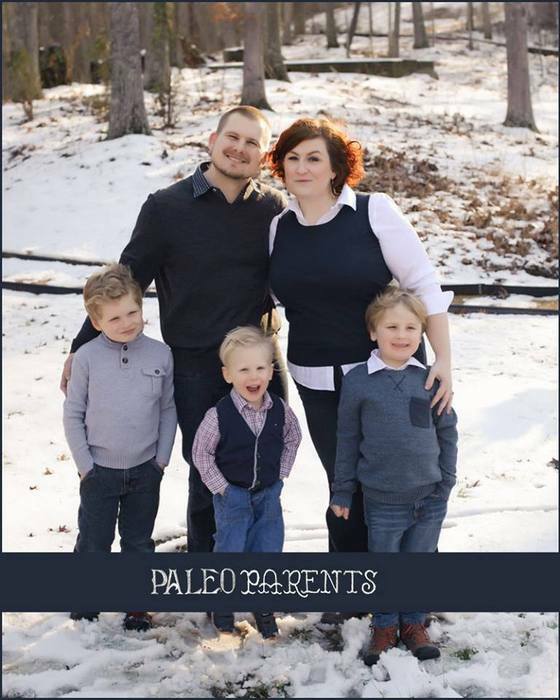 Having lost a total of over 200 pounds together themselves, and changing the health and wellness of their boys (behavioral and physical) after adopting a paleo diet, the Paleo Parents focus on a family-friendly approach to an ancestral lifestyle. They make it work for them, and they show you how you can too! Read more on their journey to health here. A muffin with the texture of a brownie? What could be better than that? And because these muffins are vegan and paleo, that means they’re also gluten free, grain free, dairy free, egg free, refined sugar free, and as already mentioned, there’s an easy substitution that can be made if you need a nut-free version. Well, their questionable muffins sure look like muffins to me and I’m happy that these Chunky Monkey Muffins are part of our MMM recipe roundup! What do you think? Check out the complete muffin recipe roundup here. In a food processor, puree together the dates and bananas until smooth. Add remaining ingredients to food processor and pulse until a thick batter forms (scrape sides to fully incorporate but do not over blend). 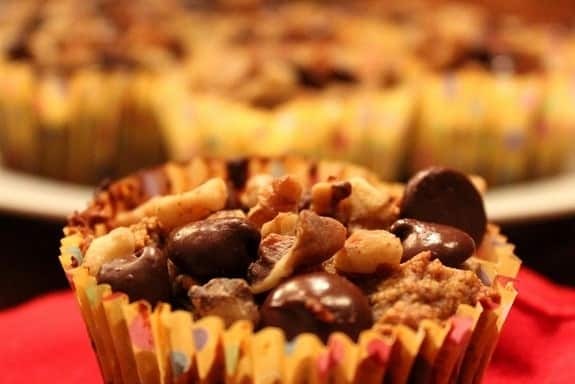 ♥Spoon into lined muffin tin, filling cups 2/3 full. ♥Toss topping ingredients together in small bowl, sprinkle on top of each muffin and press gently to get them to "stick." Bake at 350F degrees for 16 - 18 minutes. *We prefer fresh Medjool dates (usually found in the refrigerated produce section of the grocery store). We pit them ourselves and use them directly. If you are unable to find them (or find the cost too prohibitive) you can acquire a similar texture by re-hydrating dehydrated dates. Simply cover with boiling water for ten minutes, drain and use as instructed. Don’t forget to let your kids help with the easy steps (noted by a ♥). Sometimes cooking with kids can be a challenge. Finian poured in an entire ramekin of salt to our original batch (on accident) and although incredibly frustrating, it was a great learning lesson for us all. There are always teaching moments in the kitchen! Originally published March 2, 2014; updated September 20, 2017. « March Muffin Madness—Gluten-Free Muffins and All the Delicious Details! They are such a lovely family! The recipe looks super easy to make. Looking forward to try it. I’ve not used dates in baking, but I’m going to see if I can find some in the store and make these muffins. Yum! Need to get some palm shortening. Love that they don’t have eggs . Thanks! Time to buy some dates I think. Yummy, just hot out of the oven. These sound delicious! I have everything on hand except for the palm shortening. Could I just use more coconut oil? It might not work, but you could try it. Too much coconut oil can change the consistency in some baked goods. It also might make the muffins taste more of coconut, depending on what kind of coconut oil you use. Let us know if you try it and it works out fine! I ended up using melted butter in place of the palm shortening. The muffins were AMAZING! I am making them again tomorrow. Whole family (who are not GF) gobbled them up. Thanks for sharing such a great recipe. I love using mejool dates as a sweetener. I put 6 to 8 pitted dates in a bowl, cover them with 1/2 cup of filtered water, let them soak and then blend the mixture into a paste. Perfect for muffins or quick breads. I’m curious about your dark chocolate chips — what brand is sugar free? Love the chocolate, but I’m avoiding sugar and would love to have a bag of SF dark chocolate chips! Thanks! Great post and these muffins look delightful! We do not use sugar free chocolate chips. We use chips with a very high cacao content (which means a small amount of sugar) and we choose chips that are soy- free and dairy free. We really like the Equal Exchange Dark Chocolate chips that you can find on Tropical Traditions website. I am making these today! And I didn’t even know they make cast iron muffin pans! I threw my nonstick one away because I made egg muffins and the silver from the pan came off on the bottoms! Ick! Great giveaway! Wow!!! I have never seen coconut flour used without lots of eggs. Just doesn’t seem like enough liquid for all the flour. These sound wonderful. I love anything with dates. Thanks for the recipe and giveaway. Tried these and they are GREAT! What wonderful muffins! My husband can enjoy these since he doesn’t eat eggs. These look like good muffins with not too many ingredients & easy instructions. Can’t wait to try them! I love cooking with dates. These sound delicious. These muffins are a home run, such a great muffin! I am so glad they are sharing them here, your readers will love them too I am sure! These look so good, and I love the egg-free & paleo recipes! ooh, these muffins look so good. Glad I get your emails so I can get recipes like this! looks great, I have never used palm shortening before-but I am dying to try this recipe! Omg these look good. I can have egg but a couple of my friends can’t so a good recipe to have for girl’s night. Anything with banAnas and chocolate had got to be good. Love that they are fruit sweetened! Have never tried dates in a recipe. I just bought some and I’m ready to give it a try. The recipe seems to be doable. These look great! Can’t wait to make them for my grandson. Thanks so much for all of the great recipes and giveaways – love it! New to gluten free. These look great. Is there anything I can use in place of palm shortening? More coconut oil? We answered that question above, but the answer is that it might now work well because the two fats behave a little differently when baking. It also might make the product taste more coconuty depending on the coconut oil you use. But if you try it and it works out, let us know! Great recipe. Bananas and dates are great for sweetness and binding without eggs. I’m Paleo, so I just canNOT wait to try these! My husband will love them, too! I love the Paleo Parents & this recipe looks amazing! Oh gosh these look yummy! Yum! I love Paleo Parents — they have such great recipes! Boy, do these look good! I’m making these now, substituting butter for the palm oil. I love bananas and almond butter, so these are perfect! Banana muffins are a favorite for my family; can’t wait to try your recipe! Have to get more dates tomorrow – these look amazing! These look pretty darn good! I love the “chose you own ending”, it’s like the books. Did you ever read those as a kid? Those were my favorite books because they let you be creative. My son is allergic to all treenuts (including coconut) and sunflower, so these will most definitely be choose your own ending. Excited to read all about your family’s sucess with the change in diet. Thanks for sharing! This looks so much like a very-dangerous-and-gluteny recipe that my mother used to make. I may have to give this a try as well! Great for my dairy and peanut free kiddos! These look really good and my GF kiddo loves anything with chocolate chips! Thank you for these recipes. I can’t wait to try them! They look almost like granola bars. I Need to try them. Thanks! We made these tonight and like them. Made them with 1/2 cup coconut oil (no shortening) and used peanut butter in place of almond butter. We also mixed the nuts and choco chips into the batter. No food processor but mixed as much as we could in the Vitamix and then stirred it by hand. They were very moist. Now that’s the muffin I’ve been looking for – coconut flour without eggs (genius) nor a ton of sugar. Will I have to share do you think? Can’t wait to try these! We are just embarking on a paleo diet for our entire family after taking our gluten free daughter off dairy as well. Thanks for the fun recipe to help get everyone on board! These look adorable, and delicious. Thanks for sharing an egg free and grain free muffin! These look great! I will have to try them! Chocolate & nuts = yummy! Can’t wait to try! My husband loves dates – these muffins look like a fun dessert for him! MMMMMMMMMMMM!! These look great! I’m sharing on pinterest. Wow, these look really awesome. Anxious to try them. Love the variation of vanilla or chocolate! I love the variations option. I have some really ripe bananas and was looking to something yummy to make with them. These sound wonderful. I will be trying these as soon as I get all of the ingredients! Love the concept of the Paleo diet. Slowly getting there. This muffins look great. Sounds yummy. Can’t wait to try these…. I am looking forward to trying these. Look amazing…..if only we could eat bananas. Can’t wait for this elimination diet to end!!!!! Mmmm these look delicious! I can’t wait to make them! These look good! Thanks for sharing. Oh my! These sound sooo good. And best for me, no corn starch – I’m also allergic to corn! These look delicious. Cannot wait to make these. I can’t wait to try these! I like all of these ingredients and don’t usually go for “muffins” but these are a great alternative. These look to bad to be good! Yum! My husband loves bananas and I am always looking for new recipes that I can try to make for him. The dates will be interesting for us since we don’t use them enough. Thanks for this recipe. Yum!! Now to find a substitute for palm shortening… I officially can’t keep avoiding recipes bc I don’t have it and don’t know where to get it! This looks so good! Definitely saving this recipe for future use! Wow, these sound so yummy! I love the taste of banana & chocolate together, thanks for the recipe! This is awesome! I’m all over a recipe with coconut flour but no eggs!!! Thank you! Wow – I made these today and they are delicious! Just beginning my grain/dairy/sugar free journey. I’m 7 weeks in and was craving some sort of treat – these are perfect! Hoping they freeze well. I need to freeze some before I’m tempted to eat them all! Hi Darlene–Welcome to gfe! 🙂 Thanks so much for sharing your review and congrats on what sounds like a very successful beginning to your new health journey! I made these muffins this morning, Loved them they came out great. I did however substitute Peanut butter for the almond butter. Hi Laura–Yay! Thanks for taking the time to share your review with all of us! 🙂 While peanut butter is not allowed on a paleo diet (so Paleo Parents wouldn’t include it in their recipes), it’s perfectly fine for the rest of us. 😉 YUM! Can I substitute figs for dates? I am about to get a ton of figs. I have never cooked with dates so not sure if the texture is different. Chunky monkey muffins looks delicious, thanks for sharing with Hearth and soul blog hop, pinning.